With the right tools, your creative horizon changes. A tree is still timber, but suddenly in a whole new way. Old ideas germinate again, and new ideas branch into unexpected opportunities. Welcome to Adobe® Creative Suite® 5 – software that will allow you to confidently reach more people, more effectively, in more places, with whatever masterpiece you can imagine. Join us for the exclusive Global Online Launch Event, Monday, April 12, 2010. Be one of the first in the world to see new game-changing features, and join the conversa­tions leading up to the excitement! The launch site also offers a collection of eight ten “sneak peek” videos, plus social media updates for major Creative Suite products, so check it out… And we’ll have more coverage of the Adobe CS5 rollout right here as it progresses to the launch date. 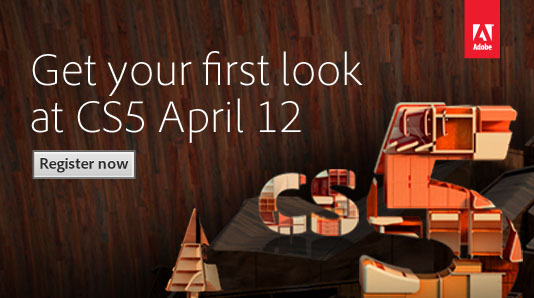 Hmm, looks like Adobe’s got a wooden/earthy/arboreal back-to-nature kind of thing going! Actually that logo is built of cabinets, shelving and drawers, rather unusual and took a zoom to confirm. Definitely going for woodtones though. Wonder what the rest will look like?